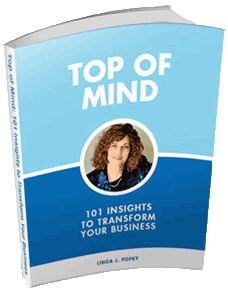 “In the course of one short meeting, Linda was able to uncover insights into my business that would not have even occurred to me otherwise. With little knowledge about my business, she reached the core issues immediately, with concise, appropriate questions. Her questioning approach led to creative ideas and solutions. To help clients better leverage their marketing investments, we are pleased to offer four assessment, mentoring and coaching options. A 60 to 90-minute one-time review of your marketing strategies, programs, goals, and objectives. We’ll look at your current marketing deliverables, fine-tune your key marketing messages, and help you set actionable, obtainable marketing objectives. Ideal for small businesses or consultants. This unique mentoring program, offered in conjunction with Million Dollar Consultant Alan Weiss, provides six months of unlimited access to Linda by e-mail, phone, fax, regular mail – or in person, if convenient for both of us. We help people strategically (how to set fees, how to gain visibility, how to position and market your practice, etc. ), and tactically (what to say at the meeting tomorrow, critiquing proposals, overcoming objections, etc.). The fee is $3,500, which distinguishes those who are serious about their business, and is easily recouped through increased business and/or higher fees. Admission is limited. If there are no openings, there is a “first come, first served” waiting list. This option begins with a Marketing Assessment (above), includes working together to develop a targeted Marketing Action Plan for obtaining longer-term objectives. Includes three scheduled monthly calls, as well as unlimited access to Leverage2Market® Associates’ President Linda Popky via phone, email, text or Skype/Webex for six months. A cost-effective choice for marketing managers and directors, small businesses or consultants. This is a more intense, more structured coaching program for those who prefer a little extra gentle push to keep their marketing efforts on track. This includes a half day Marketing Assessment session and the development of a targeted Marketing Action Plan, followed by biweekly coaching calls for 60 days. 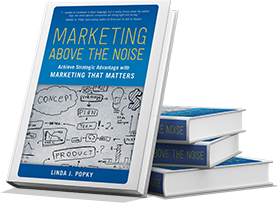 You’ll have unlimited access to Leverage2Market® Associates’ President Linda Popky via phone, email, text or Skype/Webex for the full six month period from the start of the program. For more information and a no-obligation discussion of how Leverage2Market™ can help improve your marketing leverage, contact us.